This desktop calendar makes an excellent corporate gift for customers. Not only does it have your own company details printed on every page but it also is personalised with your customer's name. The calendar features 12 images of iconic landmarks from around the world. And integrated cleverly into each image is the name of your customer. 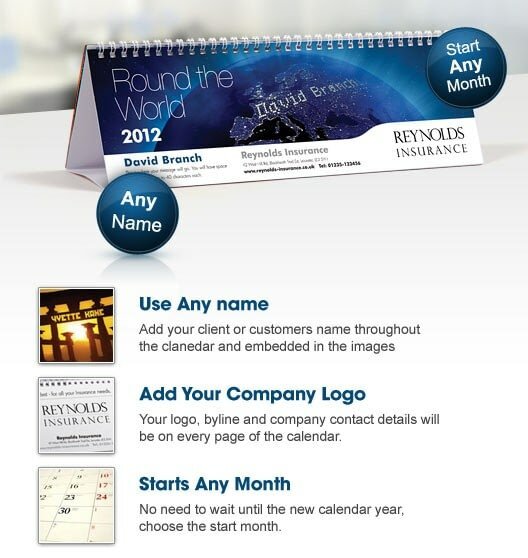 It's a great keepsake that can start on any month, perhaps in celebration of a milestone in your company's history. The calendar has a tent card stand and is wire o-bound. This is a unique gift to record an occasion such as a landmark birthday or a milestone wedding anniversary. For any canine lover this calendar with its 12 cute dog and pup images is just grrrreat. They'll certainly be in the pink with this calendar. Every one of the 12 months features a different image with a pink theme and so is ideal for a young girl's room. Bring out the creativity in your little one with this very personal gift for a close relative or friend. 12 different male themed images with your dad's name integrated into the scene, and his name and your greeting on the front cover. Do you know someone who lives life to the full and is active in an extreme sport or three? This calendar will give them an adrenalin rush. This calendar is all about togetherness and features a series of images that symbolises just that.